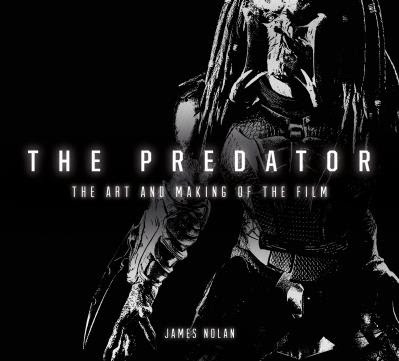 The cover for the upcoming book The Art and Making of The Predator has been revealed, showcasing an image of one of the new predators in the film. The book will feature the conceptual and practical design art from the film, and was just added to the listings on Titan Books’ website. One of the more notable features on this Predator is the singular wrist-blade design, which similar to the Super-Predators that appeared in the 2010 film, Predators. AVPGalaxy interviewed StudioADI last November and asked there would be any aspects from Predators that would influence the upcoming film. Creature designers Tom Woodruff Jr. and Alec Gillis obviously didn't provide much information at the time, but it looks like there are some influences from the 2010 film. The art book is scheduled to be released on September 18th, right after The Predator hits theaters. it was announced last month that the release date shifted its release date from August 3rd to September 14, 2018. "The Predator sets its sights on Sept. 14, 2018 instead of August 3rd. Obviously hoping to scare up some of that mad money Stephen King's IT made last year in what is typically a box office dead zone." The September 14th release date will pit it up against Alpha, The Darkest Minds, and Fighting With My Family. This was the third time that the film's release date has been changed. Originally scheduled to be released on March 2nd, it was then shifted to February 9th and then August 3rd. It was earlier reported that reshoots were scheduled in Vancouver from March 12th to March 29th. It is being helmed by Shane Black from a script that was co-written by Black and Fred Dekker. The cast includes Logan‘s Boyd Holbrook, Olivia Munn, Moonlight‘s Trevante Rhodes, Yvonne Strahovski, Jacob Tremblay, Keegan Michael-Key, Alfie Allen, Thomas Jane, Jake Busey, Edward James Olmos, among others. Black has described most of the group as “stone cold killers with some serious acting chops… but which of them will be chopped…,” signifying that most of them will meet an untimely and gory ending.